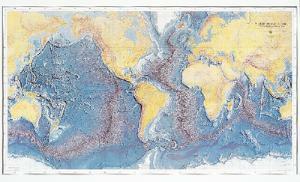 Ridges, trenches, continental shelves and slopes, mountains, islands, and more are shown in great detail on this raised relief map of the ocean floor. Show students the significance of continental margins and explore both earthquake and volcano distribution throughout the world, using this colorful visual aid. Includes a teacher's guide with suggested activities. Size: 26" x 39".